You heard it here first: Monday, August 10, is National S’mores Day. When it comes to classic s’mores, there are two camps: people who carefully roast their skewered marshmallows to an even golden-brown, methodically twirling the skewer or stick; and people like me, who set the marshmallows on fire, then extinguish the blaze by wildly waving them or blowing on them. When it comes to fire-roasting your s’more, you have several options. The best is the classic: on a sharpened stick over a blazing wood campfire. In your backyard, I’d opt for a fire pit or a charcoal grill without the grill grate. At one memorable party at our house, we positioned a lit Big Green Egg on the patio and armed guests with s’more forks to grill (make that burn) their own. Another option is to place small charcoal grills, like the Weber Smokey Joe or Lodge Sportsman’s hibachi, in the center of the table (on a heatproof stone or metal slab, of course), provide skewers, and again, let your guests grill their own. In honor of National S’mores Day, we’ve re-imagined the s’more. Upgrading ingredients, like subbing super-premium chocolate for ho-hum brands. Using homemade marshmallows or the artisanal marshmallows from companies like Wondermade: a sample pack includes marshmallows flavored with bourbon, beer, Fireball (cinnamon-flavored whiskey), and gin. Even allowing s’mores to jump line by crafting savory versions as appetizers. The constant—as always—is live-fire cooking. Replace the traditional graham crackers with homemade chocolate chip cookies or a great commercial brand, like Tate’s. 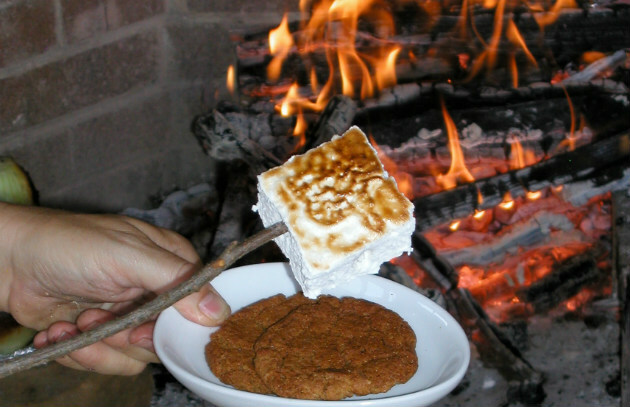 Spread the bottom of one cookie with hazelnut spread (such as Nutella), then top with a flame-roasted marshmallow. Put the second cookie, bottom side down, on top of the marshmallow. Extra points for using bourbon-flavored marshmallows. Place squares of premium Mexican chocolate on a cinnamon graham cracker, then sprinkle with pure chile powder. Add a roasted marshmallow, then top with another cinnamon graham cracker. Extra points if you use “Fireball” marshmallows. Spread the bottom of a sugar cookie with lime or lemon curd, top with a roasted marshmallow, then place the second sugar cookie (bottom side down) on top. Brush thin-cut slices of bacon with maple syrup, then coat in brown sugar. Indirect grill at 350 degrees until the bacon is crisp, about 25 minutes. Transfer to a wire rack to cool. Break each slice in two. Sandwich candied bacon with roasted marshmallows and premium caramel-filled chocolate with sea salt between graham crackers. YUM! You could call this “The Elvis.” Spread the bottoms of peanut butter cookies with peanut butter. Nestle sliced bananas into the peanut butter on one cookie. Top with candied bacon (see above). Add a roasted marshmallow, then top with the second cookie, peanut butter side down. Cut a baguette into thin slices. Brush each with olive oil, then direct grill over medium-high heat. (Watch carefully.) Spread basil pesto on one slice, then top with a fire-roasted-until-soft-and gooey ball of mozzarella (bocconcini) and an oil-packed sun-dried tomato quarter. Finish with a second slice of grilled bread. You can also use sturdy crackers for this recipe, such as Carr’s. This recipe was adapted from Steven’s book, Beer-Can Chicken. Cut a baguette into thin slices. Brush each slice with olive oil, then direct grill over medium-high heat until lightly browned. (Watch carefully.) Move half the bread away from the fire and top with a slice of Manchego or other Spanish cheese. Place a thin slice of membrillo (quince paste) on the remaining slices of bread. Sandwich them together with chopped Marcona almonds. Grill thin slices of a baguette as described above, melting American cheese on half the slices. (Slather the other halves with prepared horseradish.) Place thinly sliced roast beef on half the bread slices, then top with the remaining slices of bread, cheese side down. Grill thin slices of buttered baguette as described above, melting thin slices of Brie or Camembert on half the slices. Spread the remaining slices of bread with black olive tapenade. Sandwich the two together. Cut salami into 1/4-inch slices. Skewer cherry tomatoes and small balls of mozzarella (bocconcini) on metal skewers and grill until the cheese softens and the tomatoes have a bit of char. Sandwich the cheese and tomatoes between slices of salami with a leaf of fresh basil in each. What’s your idea for an over-the-top s’more? Please post photos and recipes to the Barbecue Board. Get Steven’s Homemade Marshmallows recipe.